Figure 14.5 Lacerations of palm and fifth finger from gas escaping from cylinder gap of .357 Magnum revolver. Hand was around cylinder at time of discharge. 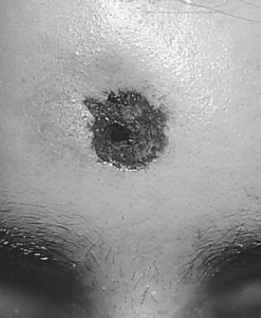 producing a wound of the forehead that had all the characteristics of a primary contact wound (Figure 14.6). With handguns, after the temple, the most common sites in the head, in decreasing order of occurrence, are the mouth, the underside of the chin, and the forehead. There are people, however, who will be different and shoot themselves on the top of the head, in the ear, in the eye, etc. The author has seen a number of unquestionable cases of suicide in which individuals have shot themselves in the back of the head. These have occurred not only with handguns but also with rifles and shotguns (Figures 14.7 and 14.8). 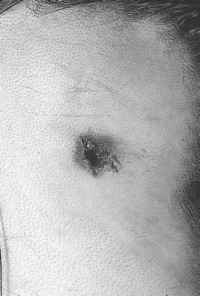 In another unusual case, the entrance wound was on the side of the chest, in the mid-axillary line. Thus, the fact that a wound is in an unusual location does not necessarily mean that it cannot be self-inflicted, though it is wise to always start with the presumption that such a case is a homicide. 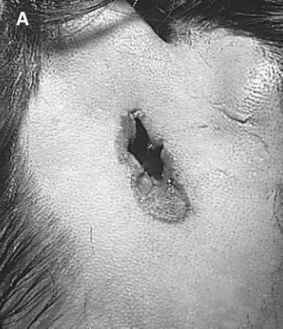 Figure 14.6 Apparent "contact" wound of forehead. In actuality, muzzle was in contact with palm which was against forehead. 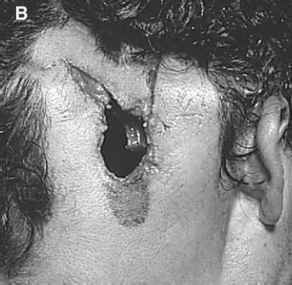 Figure 14.7 Self-inflicted contact wound of back of head from handgun. 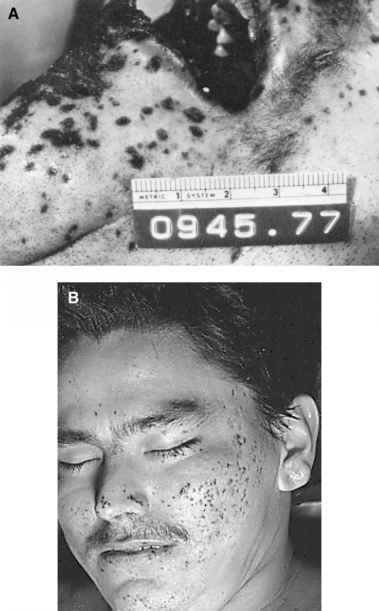 Figure 14.8 Self-inflicted gunshot wounds on back of head from (A) rifle (note imprint of magazine below entrance) and (B) shotgun.